A 430ft wind turbine is set to be built in a Derbyshire village, despite almost 90% of local residents objecting to the plan. Despite residents complaining that the wind turbine will be built less than a mile from homes in Cotmanhay, a village in Derbyshire, north of Ilkeston, leading them to voice fears over their health, TV interference and ‘visual pollution’, Broxtowe borough councillors narrowly voted in favour of Severn Trent’s plan this week. The committee voted five in favour and five against, with chairman Cllr Steve Barber having the casting ‘yes’ vote. The turbine, which will generate power for Severn Trent’s sewage works at Halls Lane, Giltbrook, will tower above the grade-II listed Bennerley viaduct and be visible from most of Ilkeston. “This application is all about money and shareholders and little to do with renewable energy,” said Paul Howard, on behalf of the residents. 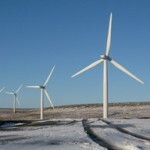 Martin Dent, the renewable energy manager from Severn Trent argued that the turbine will keep the firm’s prices the lowest in the UK for customers. “This is a good development for the area and will help safeguard the interests of our customers,” he said. The decision will be passed on to the Government as it requires special permission to be built in greenbelt.